The New Directions in Taiwan Studies program fosters new researches on and conducts scholarly exchanges with Taiwan. The program has established the UCLA Center for Chinese Studies as a forum for advanced discussions of political, social, and cultural developments in Taiwan; and benefits UCLA faculty and doctoral students by funding travel for research, conferences, and lectures. 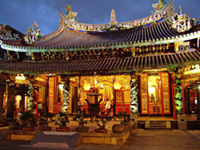 The UCLA Center for Chinese Studies announces the awarding of research grants in Taiwan Studies for 2010-11. Congratulations to awardees IRENA CRONIN (Department of Asian Languages and Cultures) and ANTHONY ESTES (Department of Anthropology).